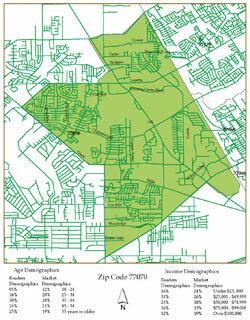 Earlier this year, Circulation Verification Council began providing free distribution maps with each audit. These maps allow national buyers to quickly see where a publication is distributed by showing state, county and zip code boundary lines, and city of publication. The Circulation Verification Council is now offering reasonably priced additional custom mapping services to publishers and advertisers. Custom maps are developed based on the specific needs of the publisher or advertiser. For example, CVC can generate maps that show street boundaries of zoned editions, major cross streets within the zone and individual carrier routes. • Be used in media kits and advertiser presentations. Fees for expanded maps vary based on size and scope of the project. For more information on CVC’s mapping services, please call Lisa Schroeter at (800) 262-6392.